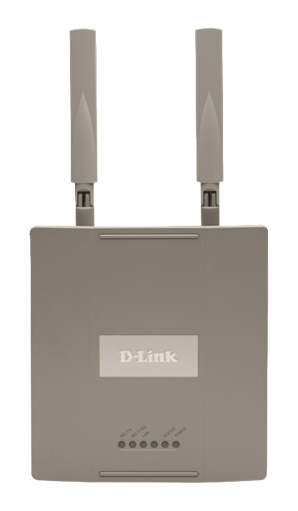 The DWL-8500AP is a part of the Unified Wired/ Wireless Switching architecture solution from D-Link. With this architecture, enterprises can deploy wired LANs as well as wireless LANs in a single homogeneous manner without compromising on the security of their networks. This solution provides seamless roaming as the mobile workers move from one access point to another and also when they connect to the wired network on their desk. All these features make DWL-8500AP and the unified switching solution from D-Link very attractive for the enterprises. Wireless Specifications: The DWL-8500AP is a dual band wireless access point that operates on 2.4 GHz and the 5 GHz range. In the lower frequency band it supports 802.11b and g standards while in the upper frequency band it supports 802.11a standard. With the backward compatibility and wireless g support, this access point can support practically all the wireless devices in the market. This is extremely significant for enterprises looking to deploy wide scale WLAN solutions as there would be all kinds of devices connecting to the network. The device also supports Power over Ethernet to aid in deployment. With PoE technology, the device just needs an Ethernet cable to be installed and powered up. This reduces the needs for additional cabling for power outlets. Wireless Security Features: The DWL-8500AP supports Wired Equivalent Privacy (WEP), Wi-Fi Protected Access (WPA/ WPA2) with Advanced Encryption Standard (AES) and 802.11i. The device provides for WPA Personal and WPA Enterprise flavors extending the use to both home and enterprise settings. With WPA Personal mode, the device provides authorization to clients requesting access to the network. With the WPA Enterprise mode, the device lets the enterprise security infrastructure authenticate the user; this lets the enterprise deploy wireless LANs without compromising the security. With MAC Address filtering and SSID broadcast disabling the device provides additional levels of security. The access point also supports Captive Portal solution as an additional security feature. With this feature, the wireless clients need to get another level of authentication after connecting to the wireless network. Once the client is connected to the network, the user needs to launch the web browser and authenticate themselves at an individual level. This authentication is done by the security AAA server like the enterprise RADIUS server. Once authenticated by the Captive Portal, the user can access the network resources. Wireless Operating Modes: The device can be configured in standalone mode or in managed mode. In the standalone mode, it acts as an independent access point used to setup the wireless network. The device becomes the hub to which various wireless clients connect to access the enterprise network or the internet. In this mode every aspect of the wireless network and the access point needs to be configured manually by the administrator. As a managed device, the access point is connected to a wireless controller switch as a part of the unified switching solution from D-Link. The switch is pre-configured with the desired settings for the wireless network. As soon as the DWL-8500AP is configured in this mode and hooked up the switch, the configuration is automatically downloaded to it. This saves the network administrators a lot of time and effort. Besides, being managed by the switch, all the access points connecting to it in this mode will have the same configuration ensuring homogeneous wireless LAN for the enterprise users. Wireless Connectivity: In the managed mode, the access point and the unified switch setup provides two distinct advantages. The first is the channel selection where in the switch can determine the best non-interfering channel to use for the users in a particular location. With a centralised control, the overall wireless network is continuously being tuned to deliver the best performance. The second advantage is the automatic power adjustments where in the switch can determine the power levels at which an access point needs to operate to reduce interference and increase throughputs. 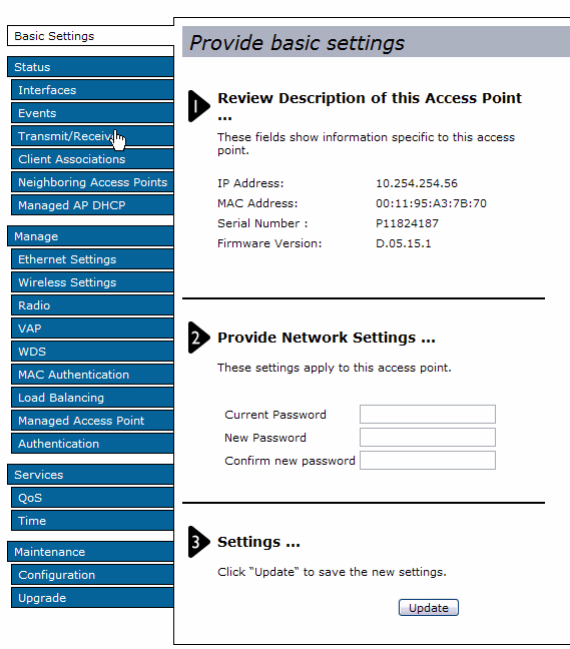 Configuring the Access Point: The DWL-8500AP supports SNMP and remote management along with web browser setup. The steps below show how to access the web browser setup. Ensure that the computer IP address is in the 10.90.90.0/24 subnet as the IP address of the access point is 10.90.90.91. Basic Settings page is displayed. Navigate through the various menu items on the left panel to configure the access point as desired.